Case: HIS-WAR-2011-03-26 – For an out-of-the-box fundraiser, I was invited to investigate a historical building in Warren County. A few of us gathered outside the doors of the building and a little bit before 11:00 pm, we walked into the historic building. This building once served as a one room schoolhouse with a small sleeping quarters for the teacher located on the second floor. It was accessible through a hatch in the ceiling. It was later added on to and used as a private residence. Among the permanent residence is Clara, the daughter of Charles and Adella Smith who purchased the house in 1910. To begin the investigation, we broke up into smaller groups of 4-5 investigators. Along with Andrew, Dina and Jason, I started down stairs to investigate the first floor which included the dining room, kitchen and living room. To add validity to this, the whistle was also captured by my camcorder. To add validity to this, the response was also captured on my camcorder. 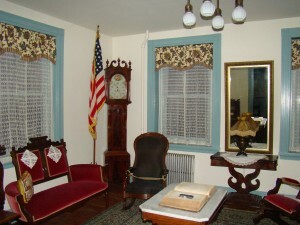 The next place I went to investigate was the small bedroom originally above the one-room schoolhouse. Present for this EVP session was Jason and myself. I also captured an unexplained orb with my camcorder. Check it out and see what you think. Note: There were no bugs to be seen because it was still very cold at this time.